Would you like to explore fantastic worlds in miniature? Close-up lenses open up new motifs in an inexpensive way. Like reading glasses, close-up lenses move the focus range into the close-up zone. The effect increases with the diopter number and the focal length of the lens. For shorter focal lengths in digital photography stronger close-up lenses are therefore recommended. The image scale describes the effect. A scale of 1 : 3 renders an object at a third of its original size on the film/sensor. Close-up and macro lenses are simple aids which are suitable in particular for three-dimensional objects (flowers) and pictorial photography, less for technical reproduction purposes. Sufficient stopping down increases the sharpness and the depth of field. As clearly illustrated, the stronger the close-up lens, the closer you can get to the subject with the same distance setting and the larger the image you can obtain. A longer exposure time is not necessary. B+W close-up lenses can be combined, but for quality reasons and to prevent vignetting no more than two lenses should be mounted over each other. The values are simply added together. Sufficient stopping down increases the sharpness and depth of field. With +1 diopter, this close-up lens is ideal for telephoto and zoom lenses with a close-up setting down to around 1 meter. Ideal in the 35 mm format for lenses between 85 mm (to about 1 : 5) and 200 mm focal length (to approx.1 : 3), and for popular standard zoom lenses. For the 50 mm standard lens, the rule is: go straight for the close-up lens +2! For all lens settings, the B+W +2 diopter close-up lens focuses at a distance of 0.5 m, so for 50 mm lenses there is seamless expansion providing an extended close-up range to approx. 1 : 4.5. For telephoto lenses up to 135 mm, the range of the NL 1 is continued seamlessly (at 85 mm to approx. 1 : 3.5, at 100 mm to approx. 1 : 3.2, and at 135 mm to approx. 1 : 2.5). With a +3 diopter, the close-up setting of this lens starts at 33 cm from the front edge regardless of the focal length. Ideal for seamless continuation of the normal close-up range (to approx. 1 : 5.5). For 85 mm and 100 mm telephotos, continues beyond the NL 2 (to 1 : 2.7 or 1 : 2.4). 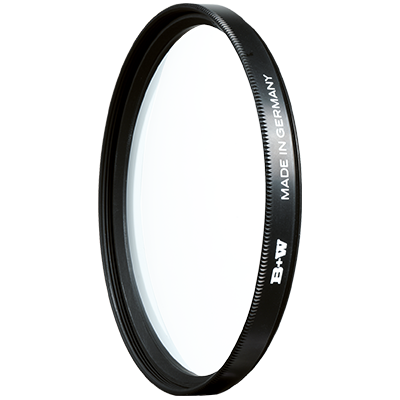 The B+W +4 diopter close-up lens is the right power for additional close-up range with the 50 mm lens (up to approx. 1 : 3) when the B+W +2 close-up lens has reached its limit. This is the maximum power for telephoto lenses with focal lengths of 85 mm (to approx. 1 : 2.1) and 100 mm (to approx. 1 : 1.9), but you should stop down to at least f/8. With a 35 mm focal length, pass straight on to the B+W +5 close-up lens. All scale data are only reference values. The exact scale values must be determined for each lens individually.